It don’t mean a thing, if it ain’t got that Bling! 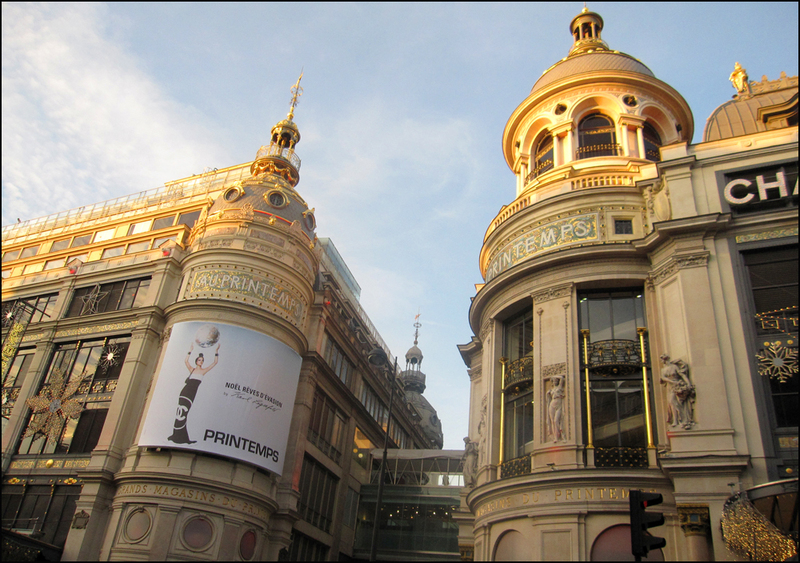 So let’s hoof it to Printemps Haussmann in Paris for a little label-gazing! But first, let’s look to Oscar Wilde for a little inspiration. After all, our favorite writer and clotheshorse was also the editor of The Woman’s World magazine way back in the original New Romantic 1880s. Wearing a puffy shirt and breeches (he dismissed trousers as “boring tubes”), along with a smoking jacket and one green carnation, he quipped, “It is only the shallow people who do not judge by appearances.” Touché, Monsieur Wilde! And speaking of keeping up appearances, les Musées de Paris aren’t the only ones in the city getting “a little work done” these days. Following suit, even Printemps has been in the final phase of an extreme makeover. Now sporting a chic-sleek modern look that nevertheless manages to pay homage to her expansive Belle Epoché days, the grand magasin’s new three-level atrium is worth a peek. 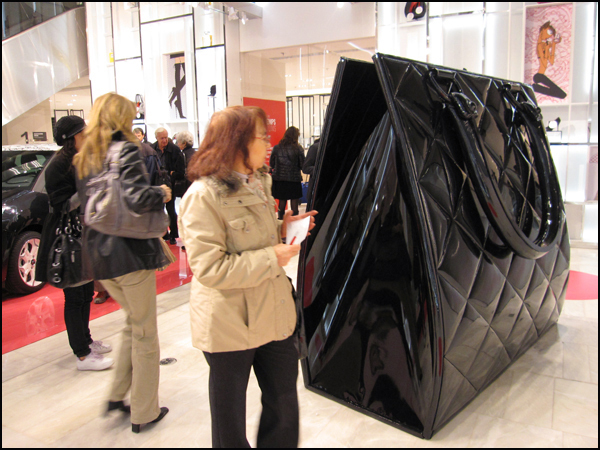 In step with other department stores and shops worldwide, Printemps wears her starkness well! On the case is the Canadian architectural firm Yabu Pushelberg. (Toronto duo George Yabu and Glenn Pushelberg were also responsible for New York’s Tiffany & Co., Neiman Marcus, and Bergdorf Goodman’s recent re-do’s.) No holds were barred, as beaucoup euros have been poured into the historic monument’s extensive interior and exterior revamping. Inside you’ll also be dazzled by the recently installed super-cool (and eco-friendly) LED lighting system that illuminates and opens up the heart of the store: the central atrium. Resembling an over-sized Lucite jewelry box, this pleasing eye candy is decked out in slick marble, sleek bands of iced chrome, and live trees that sprout multi-colored handbags. Ma joie! 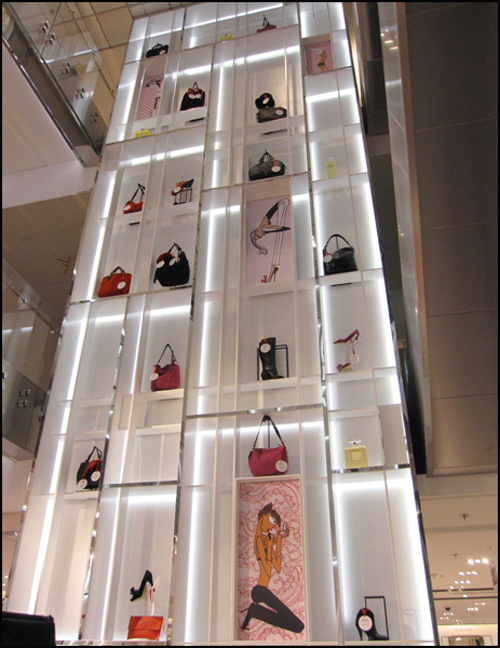 Jutting out between the bustling, zigzagging escalators are towering cubbyholes (three stories high) stuffed with shiny fab accessories and fragrances, just enough out of reach to tantalize. Oh, la la. Heads-up! Featured collections rotate. Tips: Looking for discounts? Shop during the two annual Big Sale periods in either January or June. This year’s summer sales launch on Wednesday, June 27, 2012. 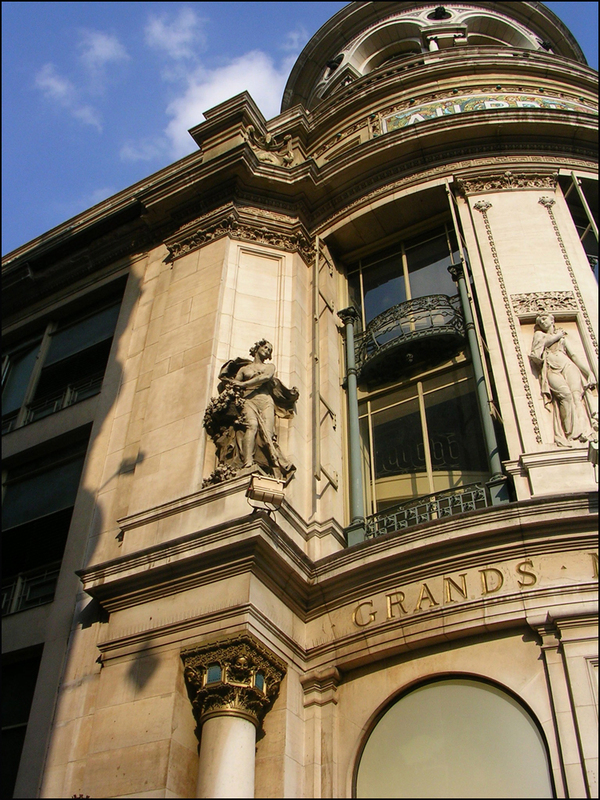 Also, the grand magasins often coordinate free art exhibits. Recently the Cracking Art Group’s Bunnies and Mr. Brainwash ‘s King Kong rocked at Printemps, while Dior held court at Bon Marché. While browsing, check out “the first luxury public toilets” by Point WC (as touted on their website). One euro buys you private seating in a water closet lit by rose-colored lights, and stocked with fluorescent toilet tissues in pinks, greens, and blues. You can’t miss the €1800 price tag for the commode, but happily you don’t have to buy it to experience it! Cosmetics for touch-ups, souvenir rolls of toilet tissue, and even beverages are available at the Point WC welcome desk. Yes, life is good–and with flattering lighting to boot! Happy Hunting! Et Bon Appétit! Beautiful pictures! I want to be there! Gorgeous, mouthwatering and beautiful as always, T. :). Thanks, Brigitte!! I’m hooked on sandwiches. Individually wrapped, often in beautifully illustrated bags, they’re delectable, affordable, and oh so portable!! T. Merci!! It was interesting to learn about Monsieur Wilde’s editorial days with The Woman’s World magazine. I had no idea! T.
…………you know of course the baguette con jamon y queso was my favorite! Dear Mr. Tinman, I agree! 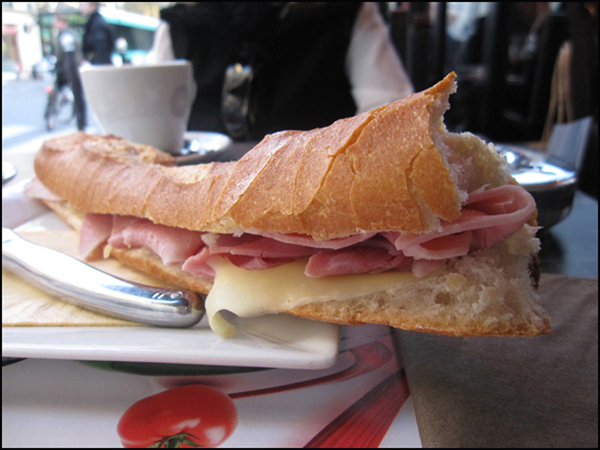 The baguette con jamon y queso is the best-dressed sandwich in the city!! I’m hooked. T.
Thanks, Virginia!! Hands-down, the “Either the wallpaper goes, or I do” is one of my all-time favorite Wilde quotes. I also like, “To love oneself is the beginning of a lifelong romance.” Enjoy the weekend! T.
Love the summer sales!! We we there last year and missed the Hermès vente privée by a week 😦 But our shopping haul from Galeries Lafayette and Le Bon Marché was awesome!! Will have to check out Printemps this year when we get back. Love the ‘nesting suitcase’ idea. Will have to use it for this trip. Yes, looking forward to discovering St. Germain. (We only stopped by briefly on our last visit) We’re staying at an apartment in rue St. Andres des Arts. Annick Goutal is already on my list and so is Les Salon du Palais Royal. I’m looking forward to stocking up on some french scents 🙂 Will look out for Agnes B. By the way, I’ve included the market at Porte de Vanves in our plans as per your advice. So looking forward to it and I’ve started counting down the days – just a little over 3 months. Excited! Such fascinating posts you have! ‘Tis a pleasure to peruse them. so much fun, like usually. 🙂 have a lovely day! These are great tips. There’s nothing like a little shopping in Paris! I will be in Paris next week! Def. A store that defines expensive fashion. This will.foreva be a window.shoppin haven. Nada Mas Nada Menos ! Oh. Yes. That’s why I patiently wait until the Big Sales in June and January. From time to time, I’m able to score pieces from the Printemps house collection at the Sympa bargain bins in Montmartre for a few euros a pop. Happy days! T.
im living in paris vicariously through you! This makes so excited!! Two months to go…..xo Theadora! Shira! Wow. Now. Let the two-month count down begin!! Sixty days?! T.
You always make me feel as if you are leading me you through all the shopping realms of Paris. What a wonderful guide and companion! Thanks for taking me along on your tours if only vicariously. Alas, if only they were real, but I’m stuck at home for the time being . . . through your magical words and images, however, I escape! Dear Martino, You always leave such sweet, sweet words. Your thoughtful messages always make my day, my week. Thank you. T.
Oh the sandwhich! Oh the lifesize bag! Oh the beauty of it all! Love it. Wheels and a leash!! T.
Stunning as usual. I think the ‘four seasons’ is absolutely beautiful. Thanks, Rhonda!! 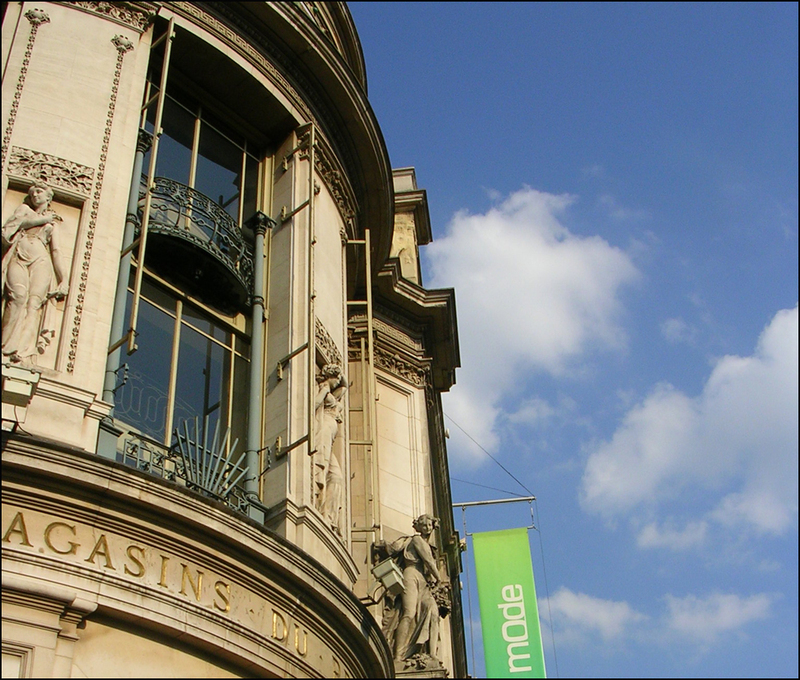 Later on this summer, I’ll report on Galeries Layfayette and Bon Marché! Both are beauties. Enjoy your weekend!! T.
Thanks T…little soggy but washing the pollen away, so it’s all good. Can’t wait to see what you do next! Beautiful, as always! 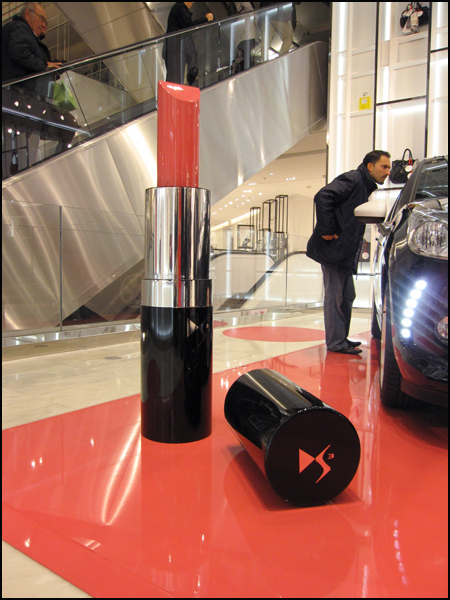 Love the giant lipstick and the man behind it, looking at the car. As always, I’m off to eat after reading your blog and looking at pictures of delicious food! Thanks!! I guess the “accessories” exhibit included a little something for everyone. His expression is quite intense! It was interesting to watch folks stare at the over-sized cosmetics. A powder puff compact completed the set! T.
What lovely photos, Theadora! Looking at this, I can’t help but think of the Samaritaine and wish with all my heart I was connected with the right people to get get one of the rent controlled apartments available after its renovation. Thanks for a beautiful post! Thanks, Paul! 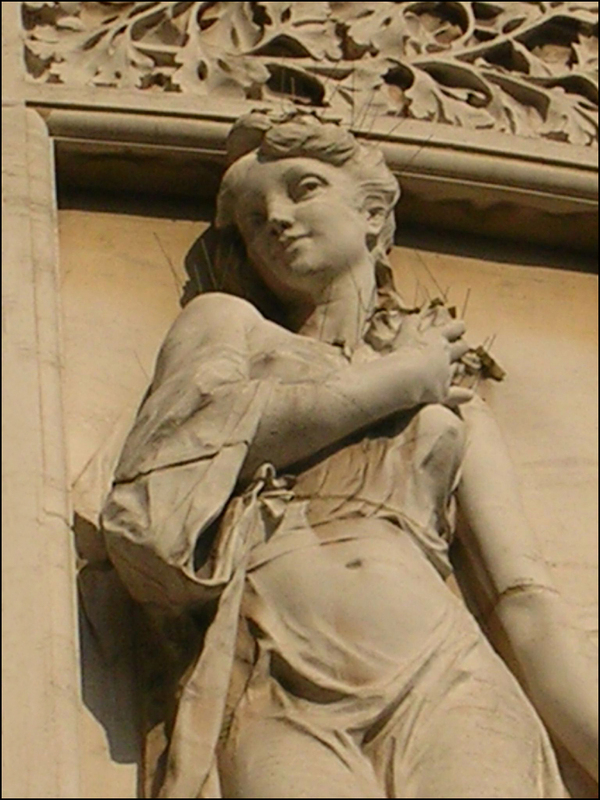 Oh, La Samaritaine. I still shop at Zara and Sephora (located on the ground level) but it’s not the same experience. Living there in a rent controlled flat would be a dream come true. At this point, they’re not touching the façade. Thank goodness. Are you going to give it a shot? T.
With my schedule I’m just happy to get outside once in a while…….you’re always a breath of fresh air. Ha! Funny!! But even if I “supersized” my accessories, I’d need a backup bag, lipstick and powder puff. As my grandmother used to say, be prepared!! T.
And WOW love the giant purse and lipstick! Love your blog; I swear I live vicariously through your travels! A post good enough to eat! And what a glitzy department store, I love it! Bonjour, Monsieur Cathey!! Well, your “Tom’s Eye View” site is fun and witty, to boot. I’ve been digging your New York City posts. Printemps? Impressive! Where can shopping and design fanatics currently find your wares? T.
Oh, yes!! Oh, no. So you missed Printemps. I love Boulevard Haussmann. It’s one of my favorite hoods in the city. Did you check out Galerie Lafayette’s dome? It’s a stunner. Again, I’m looking forward to your Paris reports!! T.